It's 1976 and the ABA and the NBA are on the brink of a merger. 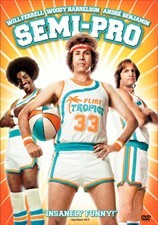 That's bad news for Jackie Moon (Will Ferrell), the owner, coach and power forward for the low-ranked ABA Flint Tropics. Since only the top four teams from his league will be absorbed into the NBA, Moon recruits an over-the-hill shooting guard (Woody Harrelson) to help him and his star player (Andre Benjamin) improve their record. Maura Tierney, Wil l Arnett, Andrew Daly also star in this hilarious sports send-up. 91 min. Standard and Widescreen; Soundtracks: English Dolby Digital 5.1 EX, Dolby Digital stereo Surround; Subtitles: English, Spanish. It's 1976 and the ABA and the NBA are on the brink of a merger. That's bad news for Jackie Moon (Will Ferrell), the owner, coach and power forward for the low-ranked ABA Flint Tropics. Since only the top four teams from his league will be absorbed into the NBA, Moon recruits an over-the-hill shooting guard (Woody Harrelson) to help him and his star player (Andre Benjamin) improve their record. Maura Tierney, Wil l Arnett, Andrew Daly also star in this hilarious sports send-up. Includes both the original theatrical and unrated versions; 91 min./100 min. Standard and Widescreen; Soundtracks: English Dolby Digital 5.1 EX, Dolby Digital stereo Surround; Subtitles: English, Spanish; deleted scenes; featurettes; music video; theatrical trailers.